All Chocolate Fountains by Sarah’s Sweet Fountains » Blog Archive » Sephra Cortez 23″ Commercial Chocolate Fountain - BACK IN STOCK! Sephra Cortez 23″ Commercial Chocolate Fountain - BACK IN STOCK! YOU HAVE BEEN WAITING AND IT IS FINALLY HERE! Get your 23″ Cortez fountain before they are gone again (limited quantities currently available!). Sephra’s 23 inch, three tiered fountain is the most affordable and portable model. Ideal for small events or as an accent to larger chocolate fountains, the Cortez creates endless possibilities when used with other chocolates or fondues. 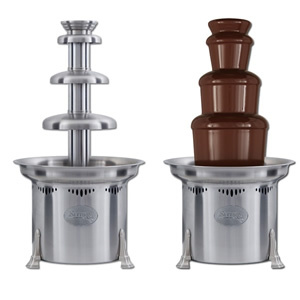 If you are looking for a chocolate & fondue fountain to get your Chocolate Fountain business started, the Cortez is an excellent choice, and usually pays for itself in just a few events. Sephra™ Commercial Chocolate Fountains are proudly protected by the only LIMITED LIFETIME WARRANTY in the industry! Sephra Cortez 23″ Commercial chocolate fountain (plus 20 lbs of FREE chocolate): $1,199.99 with FREE shipping! Click HERE for more details. HURRY OFFER ENDS SOON! Sephra Cortez Chocolate Fountain Business Pack (includes three Sephra fountains, chocolate, caramel & skewers): $1,599.99 with FREE shipping! Click HERE for more details. PLEASE DO NOT HESITATE TO CONTACT US WITH ANY QUESTIONS AT 1-877-313-0200 EXT 1. This entry was posted on Friday, August 13th, 2010 at 1:31 pm	and is filed under Announcements, Chocolate Fountain, Chocolate Fountain Business, Commercial Chocolate Fountains, Sarah's Sweet Fountains, Sephra Commercial Chocolate Fountains. You can follow any responses to this entry through the RSS 2.0 feed. Both comments and pings are currently closed.